First-time house buyers Nic Chin and his wife Euodia Ooi spent three years looking for the ideal property. 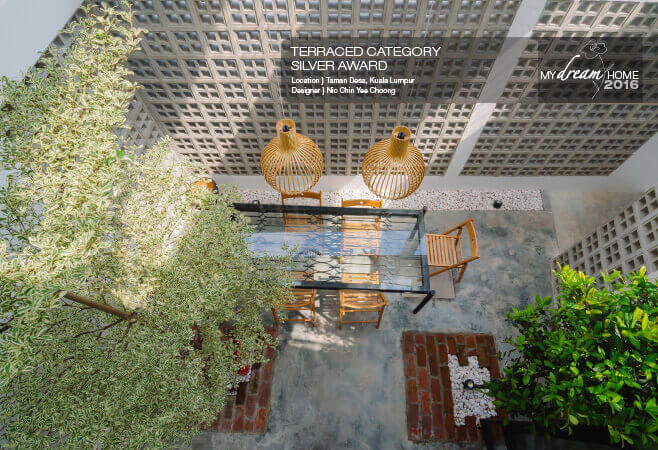 After deciding on a terraced unit in Taman Desa, they set about turning it into their dream home. As an energy and green building consultant, Chin specialises in designing low-energy buildings and estimating the energy consumption of a structure before it is built. Selecting materials that suit low energy consumption is an important part of his job. Chin applied his expertise to the design, layout and materials used when renovating his new place with his contractor. Practicality and accessibility were key elements that shaped his plans. 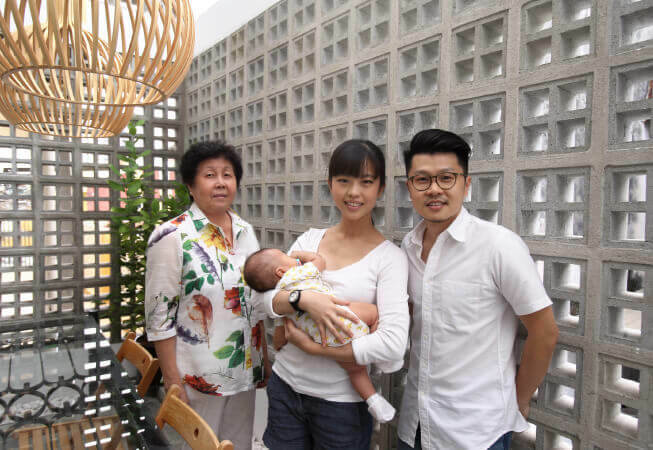 Five months ago, the couple, together with their newborn son and Chin’s mother moved into their unassuming home which as an open layout and an understated elegance reflecting its past and present. 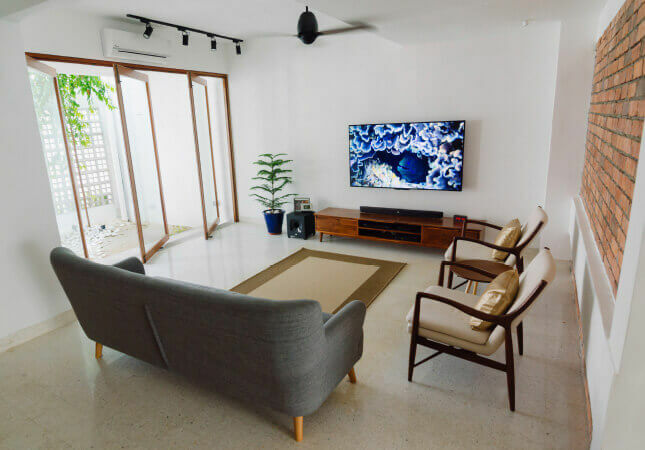 The house was built in the 1970s and Chin has kept a few of the original elements of the structure, such as the polished flooring in the living room and the parquet flooring on the upper floor. “It takes effort and time to make sure the contractor does not simply throw out all these pieces because it is so easy to do that,” he says. The ground floor, which houses the living room, guest room and kitchen, contains a mix of modern and retro touches. There are raw finished accents in the living room — a part of the brick walls have been left unpainted — which complement the flooring and wooden staircase. Chin had sought input from his wife and mother to make the airy kitchen as practical as possible. 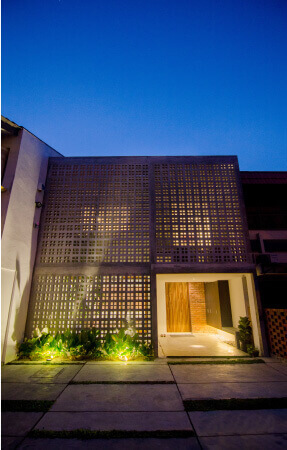 The result is an immaculate and modern space that radiates calm, and opens out into the courtyard. An island in the centre of the kitchen and metal sliding doors that lead to the courtyard have a strong Scandinavian aesthetic. 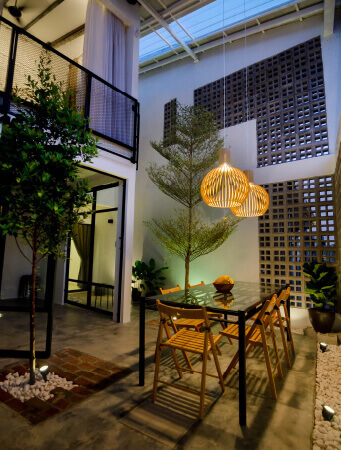 Maintaining a balance between retro and modern, the courtyard — ideal for entertaining family and friends — is shaded and adds to the cosy and spacious feel of the house. In keeping with the raw finish is the cement flooring of the courtyard, which is decorated with pebbles at the corners. A metal table and two lamps enhance the Nordic element of the ambience. The table top was previously an old metal grille and retains its original patterns. Wood, the main material used in the house, contrasts nicely with its white surroundings. Chin chose mostly used reclaimed and solid wood for both the furniture and building materials. Beside the staircase in the living room is a wooden screen made from reclaimed wood. 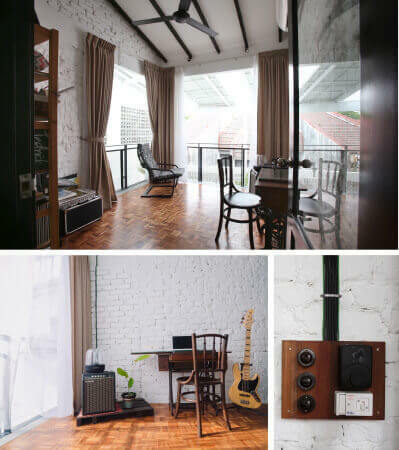 Chin’s study has wooden light switch panels that add to the vintage elements of the house. The bathroom in the master bedroom features a wooden table with a ceramic basin made from pinewood. The upper floor of the house retains most of its original layout, but two bedrooms have been merged to make the master bedroom, which as a half wall separating the sleeping area and walk-in closet. At first glance, the master bedroom appears to have a minimalist aesthetic. 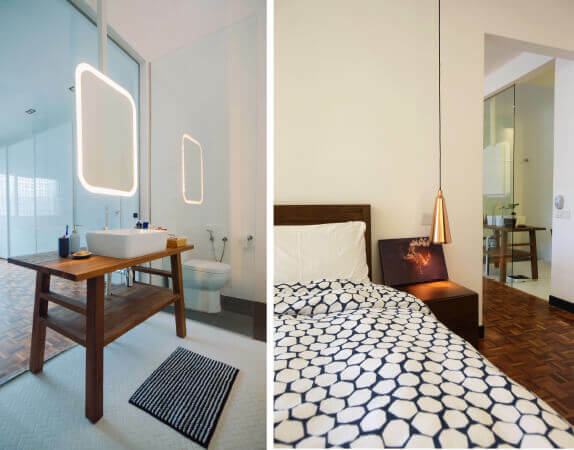 But look again and subtle details emerge: hexagonal tiles in the bathroom and a copper bedside lamp that dangles from the ceiling. This floor also houses the study, Chin’s mother’s bedroom and a storeroom that one has to climb a wooden ladder to reach. One of the most unique aspects of the house, the study encapsulates Chin’s vision of form and function. Situated directly above the kitchen, it looks out to the courtyard as the front wall had been knocked down to make a balcony. The study has an old sewing machine with a glass top that serves as Chin’s work table. It goes well with the parquet flooring and white brick walls. Another personal touch is a guitar and amplifier placed beside the table, within easy reach of the homeowner, so he can jam to his heart’s content.